I love all things sweet and sour and lemon chicken ranks very high on my favourite list. It is such a simple recipe but so very tasty. Beats KFC anytime. If you don't already know a good recipe, this is how I make it. The recipe I like is chicken coated with cornflour (cornstarch) then shallow fried/deep fried. The chicken coating is very crispy and sauce is tangy and flavoursome. 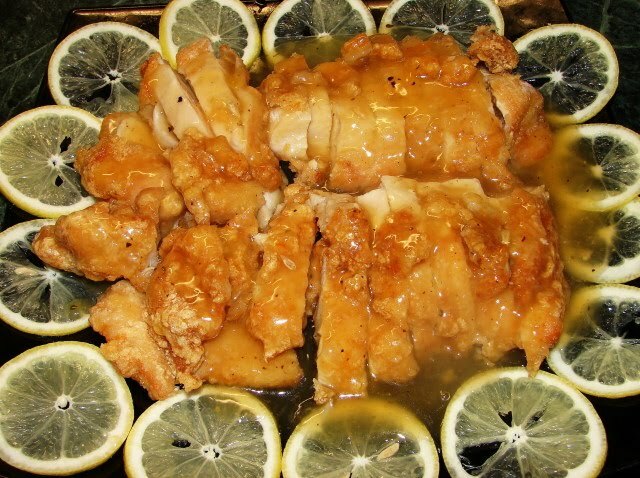 I prefer to use boneless chicken breasts for lemon chicken, find the meat quicker to cook, tender and juicy. Mix chicken with marinade. Cornflour is added to the marinade to ensure chicken will coat with enough egg white before coating with dry cornflour. Egg white and cornflour make a very crispy coating. Leave to marinate for about 30 minutes to 1 hour. Spread about 1/3 cup cornflour on a large plate, coat the chicken with generous layer of cornflour. When oil is hot fry the chicken pieces at medium high heat, till nice golden brown, hard and crispy both sides. Remove and drain on a rack, can leave in a warm oven up to 30 minutes if you like to serve a little longer. Remove oil and clean wok. Mix the sauce ingredients together. Cook using small saucepan or wok till thicken, taste if need more lemon juice, sugar or soy, if sauce is too thick can add a bit more water, then stir in 1 tsp of oil. Oil will help the sauce shiny. Cut the chicken into pieces place on a plate, garnish with lemon slices if prefer, then pour on sauce just before serving. Looks delicious! Can you use yellow food coloring instead of the custard powder? Yes you can, couple of drops. I have seen someone using orange and lemon cordial drinks (concentrated) to make the sauce! I think I prefer to cook it the old fashion way...looks good! Gill just mentioned your blog on another forum (i'm one of her bread baking friends) and so I have come to visit. I will have to come back later on when I have a bit more time. So many wonderful looking recipes here and great pictures. Glorious! Thank you for reading my blog Joanna. Hope you like some of my recipes.